The ability of urban estuaries to sequester carbon dioxide (CO2) and the strength of these sinks is mainly unknown and so is their cumulative effect on global climate change. Measurements of CO2 fluxes are crucial to estimate carbon (C) sink strengths from vegetation. 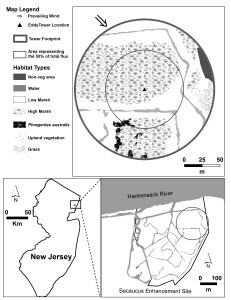 The carbon sequestration service of these ecosystems may represent underutilized CO2 sinks that can be potentially enhanced with proper management strategies. This project aims to estimate the Net Ecosystem Exchange (NEE) of dominant wetland communities (i.e. 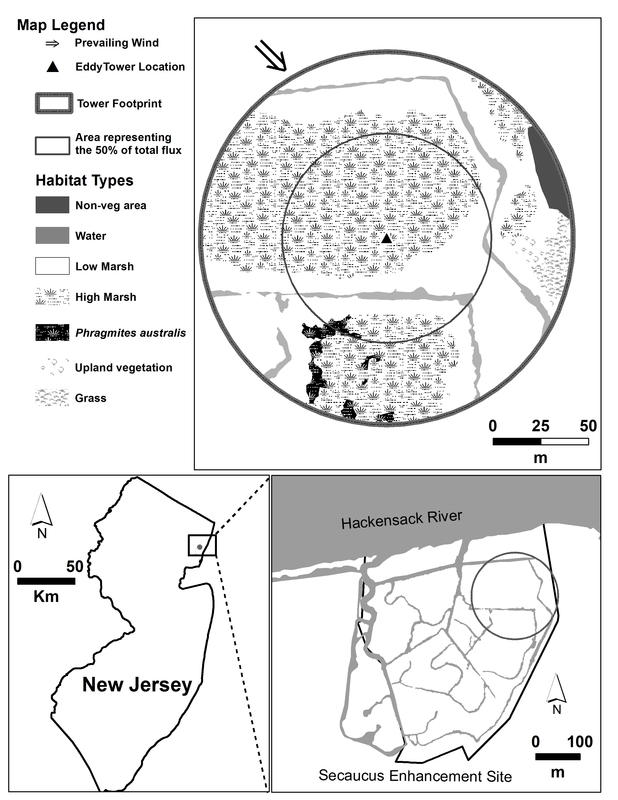 Phragmites australis, Spartina alterniflora and Spartina patterns) at an enhanced salt marsh site by measuring CO2 fluxes using the eddy covariance technique concomitant with soil and meteorological measurements. Vegetation communities are fitted with an eddy flux tower to continuously measure 3D wind with a sonic anemometer as well as CO2 and H2O concentrations averaged over 30 minutes. Supplemental measurements include net radiation, soil moisture, soil heat flux, soil temperature, air temperature, and air humidity which will also be monitored continuously. The study compares the CO2 exchange above the marsh canopy to what is buried in the sediments as total organic carbon and confirms that tidal marshes are net nutrient sources through continuous sediment loss via tidal fluctuation but are also net sinks of carbon and have great potential for long term carbon storage. From the 1950’s the average sedimentation rate has been 0.112 cm/year, the average annual rise in sea level on the other hand has been 0.17 ± 0.03mm per year. 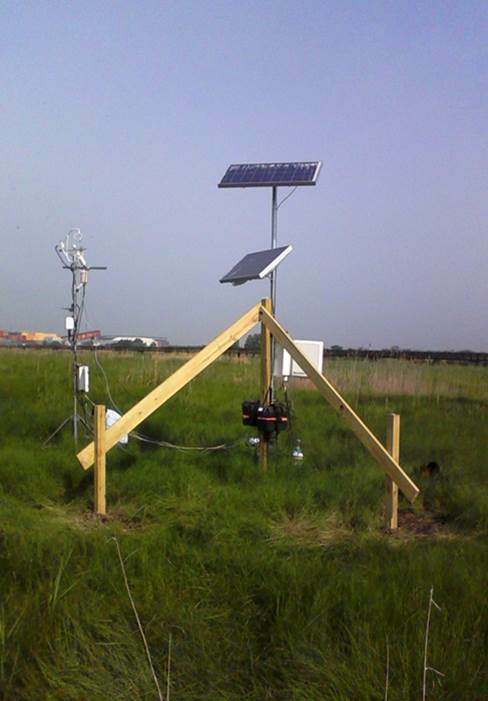 Eddy-covariance method estimated Net Ecosystem Exchange (NEE) through the measurement of CO2 fluxes. The low marsh community of Spartina alterniflora showed NEE to be 2 to 4 units higher than the high marsh community. The gross primary production during the year was 979 g C m-2, while the loss through respiration was 766 g C m-2, resulting in a net uptake of 213 g C m-2. The net ecosystem carbon balance (NECB) over large time scales was estimated by measuring the actual amount of total organic carbon contained in properly dated sediment cores. Results showed that 78% of organic carbon remained stored in the sediments after 130 years and only the most recalcitrant carbon (50%) remained under storage beyond 1785 years.